Hi friend! I hope you’ve been having a spectacular week. I just got home from an incredible two weeks in BC. I explored Vancouver Island with my best friend and spent a few days in Whistler with my family, where I met JUSTIN TRUDEAU! Anyone who knows me knows how much I love him and his wife, so this was definitely a cherry on top of an incredible vacation. While I was away I ate salmon every day because fresh seafood is my weakness and I don’t get a ton of it here in the prairies… shocking, huh? 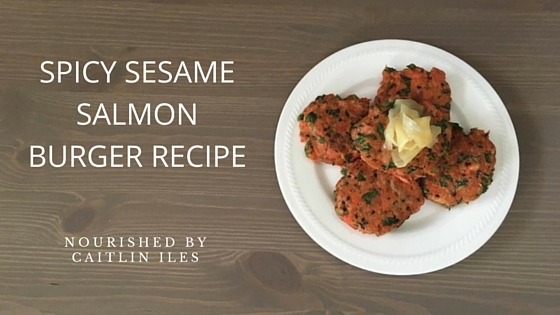 When I got back wild pacific salmon was on sale at my grocery store so I decided to buy a whole salmon and experiment with some recipes and thus this Spicy Sesame Salmon Burger was born! I’m working on a series about inflammation as requested by some of the members in my Fully Nourished Facebook Community and salmon is one of the foods at the very top of my list of suggestions in an anti-inflammatory diet. I’ve also packed them with cilantro for its detoxification benefits, sesame seeds for a shot of calcium, and coconut flour for some fibre and because it’s a great gluten-free alternative. This paleo-friendly Salmon Burger recipe is super easy to pull together and packed with flavour and nutrition. Feel free to get creative with the herbs and spices and play with different toppings to make this recipe your own! Combine all ingredients into a large bowl, mixing thoroughly with hands. Form into small balls and then press into flat patties. Add oil to frying pan and place patties into oil. Let cook for 3-4 minutes or until bottom is golden brown, then flip. Remove from heat and let cool on wire cooling rack. Tastes great with my Avocado Ginger Lime Dressing or my Tahini Yogurt Dipping Sauce! Well friend that’s our deliciously anti-inflammatory, Asian-inspired salmon recipe for this week. And remember, if you need any extra support to help you feel strong and healthy, make sure you download my FREE Anti-Inflammatory Meal Plan & Shopping List right here! Have a wonderful week friend! 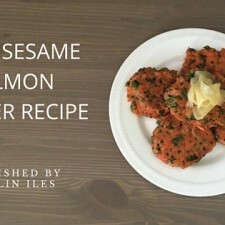 Just purchased salmon over the weekend 🙂 I’ll have to try this recipe!! Looks delicious. Thanks for sharing.